What is Steam, and How Do You Sign Up? Steam is a digital storefront for games that works with Windows, MacOS, and Linux. It's also a community portal where you can connect with friends to see what they're playing, share screenshots and videos, and play both cooperative and competitive multiplayer games. 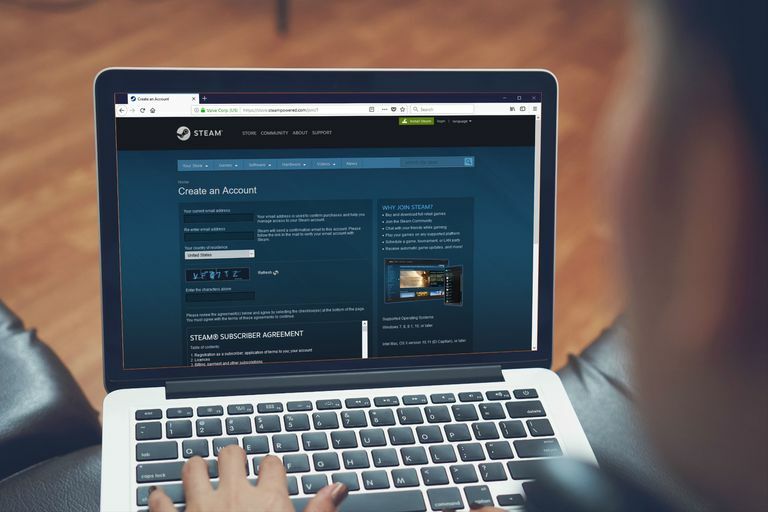 Signing up for a Steam account is totally free, and there are no ongoing costs to use the service. What Is the Steam Community? In addition to a storefront where you can buy games, and a desktop app that allows you to easily download and organize your games, Steam also has a lot of community features. When you sign up for Steam, you get access to game forums, guides, reviews, the Steam Workshop where you can check out mods and new game assets, and Steam Chat. Steam has a desktop application that works on Windows, MacOS, and Linux. The application includes both the storefront, where you can buy games, and the community aspect, including Steam Chat. In addition to the app, you can also access most Steam features through a web browser. You can buy games using steampowered.com, and you can access the community features, including Steam Chat, through steamcommunity.com. Signing up for Steam is free, and you can complete the entire process using a web browser. All you need is a modern web browser, like Firefox, Edge, or Chrome, and a working email address. If you don't have your own email address, or you don't want to use your main email to sign up for steam, check out our list of free email service providers. Enter your email address, and then enter it again below to confirm. Enter the captcha code in the field where it says Enter the characters above. If you can't read the letters in the captcha, click Refresh for a new set. Scroll down to the STEAM SUBSCRIBER AGREEMENT section. Read the subscriber agreement, and check the box where it says I agree AND am 13 years of age or older. Leave this page open. If you access your email with your web browser, do it in a new tab. After you confirm your email address, you will return to this page to complete the signup process. When the Verify Your Email popup appears, that means Valve has sent you a confirmation email. Look for an email from Valve titled New Steam Account Email Verification. Open the email, and click Create My Account. Close the email verification page, and return to the Steam signup page that you left open earlier. Choose a Steam account name, and enter it into the Create a Steam account name field. You can change the username that other Steam users see at any time, if you decide that you don't like the name you chose during this step. Changing your Steam name is free, and you can do it as often as you like. Enter a password into the Choose a password field, and then enter it again in the field below that to confirm. Once you've successfully signed up for a Steam account, you need to set up your profile. Setting up your profile makes it so that your friends can find you on the service, and one of the best things about Steam is that it helps facilitate playing games online with your friends. Navigate to steamcommunity.com, and sign in if you aren't already signed in. Place your mouse cursor over your user name. When the drop down menu appears, click Profile. The profile name is the name that other steam users will see when you interact with them. You can change this name at any time. You do not have to use your actual legal name. If you are concerned about security or privacy, leave this field blank or use a fake name. This field is useful if you want your real life friends to be able to find you by searching Steam for your real name. Choose your country if you want your country of origin to appear on your profile. This custom URL is where your profile will live, which makes it easier for you and others to view your profile in the future. You don't have to set a custom URL if you don't want to. Click Browse to upload your own avatar image, or select one from the avatars provided by Steam. Click Link with Facebook if you want to be able to easily find your Facebook friends on Steam. Enter your profile or bio information in the Summary field, if there's anything you want people on Steam to know about you. Click Select Group if you joined Steam to play with friends or a community that has a Steam Group, or ignore that section if you're totally new to Steam. Once your profile is live, you can click Edit Profile to change any of the information you provided during creation. As you buy and play games, over time, you will unlock more profile customization options, bigger friends lists, and other features. Setting up your profile is important when you have a new account, because brand new accounts can't send friend requests. With your profile in place, your friends will have an easier time finding you. If you want to be able to send friend requests, and access other Steam Community features like group chat and the Steam Market, all account limitations are removed after you make a purchase in the Steam store or add money to your Steam Wallet.